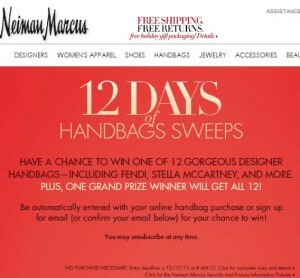 Enter to Win Designer Handbags Neiman Marcus giveaway. The 12 Day of Handbags Sweeps could see you winning some major Handbag arm candy this holiday season! Who wouldn’t want to win designer handbags!? 13 lucky winners will be sporting the latest and best in handbag couture in 2014 and if I am not the winner I will be immensely jealous! Free designer handbags is almost as good as free cash (to me anyway!) simply because my husband would suggest we do something sensible with the cash, but the hand bags…. oooooh there is nothing sensible about owning these luxury items! Enter before the end date of December 17th, 2013 for your chance to walk away is style in 2014! 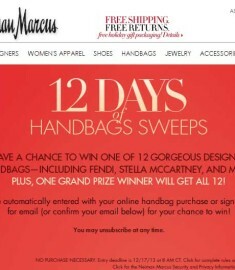 13 lucky winner (13 is funny number to be considered lucky, but in this case…) The Chance to win one of 12 Designer Handbags! Fendi Stella McCartney and more! One lucky winner will receive all 12 (OMG handbag heaven fantasy right now) I honestly think winning all these handbags is better than anything! Sign up with your email or with a handbag purchase. The ARV of the grand prize is $22,995! I can safely say most of us will never own $22,995 in handbags! Here is the scrumtious list of bag up for grabs! “CHLOÉ Marcie Large Shoulder Bag $2,050, LANVIN Trilogy Medium Tote $2,490, EDIE PARKER Flavia Clutch $1,095, VBH Leopard Brera Satchel $3,300, MARC JACOBS Baroque Bag $950, DOLCE & GABBANA Miss Sicily Brocade Flap Bag $1,595, NANCY GONZALEZ Crocodile Clutch $1,540, SAINT LAURENT Classic Cabas Clutch $2,695, SALVATORE FERRAGAMO Lock Story Clutch $950, FENDI 2Jours Medium Tote $2,350, ALEXANDER MCQUEEN Leather Net Skull-Clasp Clutch $2,385, STELLA MCCARTNEY Falabella Big Tote Bag $1,595! The Falabella Big Tote by Stella McCartney is Vegan friendly and is seen on all the celebrities! Win designer handbags today! I love a great Christmas sweepstakes and this one is getting me very excited! Sweepstakes I am a single mother of five awesome kids 4 boys and 1 girl!